Whilst strolling around on Seb Lee-Delisle‘s GitHub account, I noticed he pushed PixelPhones to it 5 days ago. 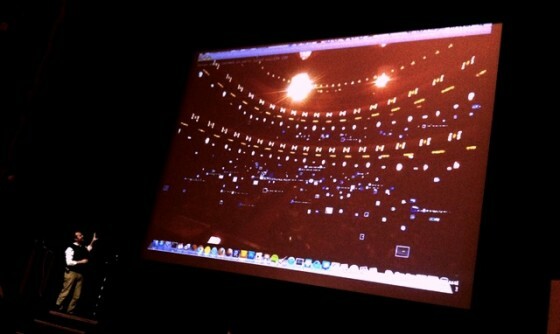 Seb’s PixelPhones project is one of the most amazing things I’ve seen at Fronteers’11 ever: use your mobile device to visit a webpage where a connection is opened to the PixelPhones server (via a websocket). Once connected the server can send commands over the socket to change the background color of the page. The result is an entire room of screens simultaneously changing color. The true jaw-dropping moment arrives when Seb asks everyone to turn his phone towards a webcam he has hooked to the computer running the PixelPhones server. By letting each phone flash a unique sequence of colors (think morse-code, but slightly different) he can define the precise location of each phone in the room. Given this he can target which part of the room should change color, and eventually send a streaming wave of color from left to right through the entire room.